I know how you feel, little frog. The shadows have grown long, your belly is full, your eyelids are heavy. Sleep, little frog, sleep. Pay no attention to the cold linoleum beneath you, or the fact that your handler has left you out in the open, exposed to sun and predators. Just sleep. It'll all go away. That's similar to the mantra I hear in my head as my work day comes to a close and there are more things not done than got done. who's been bakin' frog cookies? My kids think that the frog is adorable. 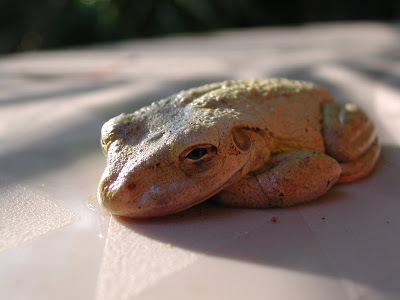 Looks like a Cuban tree frog, actually an invasive species in FL.